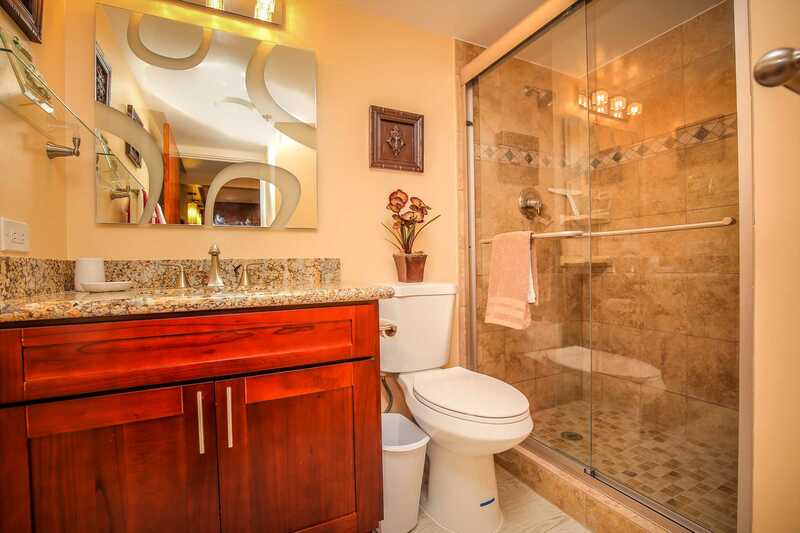 This condo is a fully equipped remodel. This place is a must stop for 1st time visitors of this beautiful island. Great people to work with, and always accommodating. For sure will stay here on our next visit. Much love and appreciation for sharing your beautiful place with us! Our first time in Hawaii just mada it extra special withyour good vibe and hospitality! Mahalo! We liked it was great and to our expectations but limited kitchen tools. suit you. This is exactly what we wanted. Downside was noise from traffic but we expected that! Excellent Vacation Spot! Hidden Treasure! We wish we would have found this place years ago! We can not wait to return!! 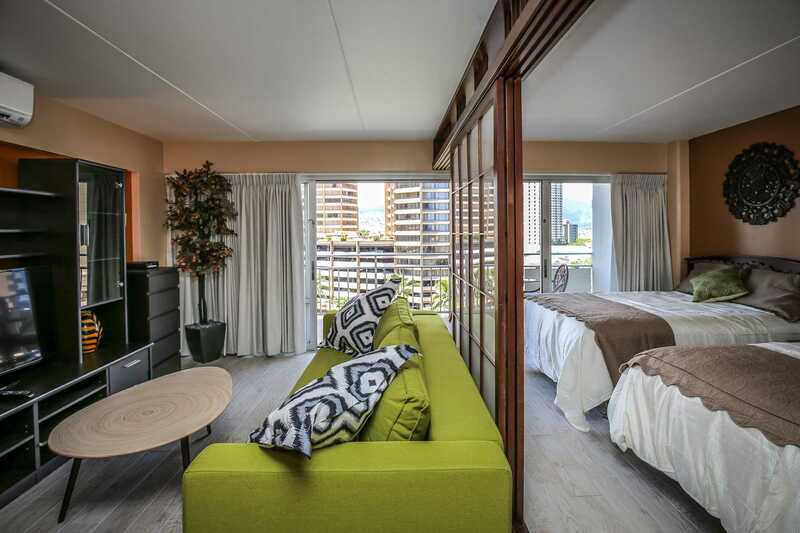 If you like to be near the beach in Waikiki, and are looking to stay in a hotel...look no further! This is even better! 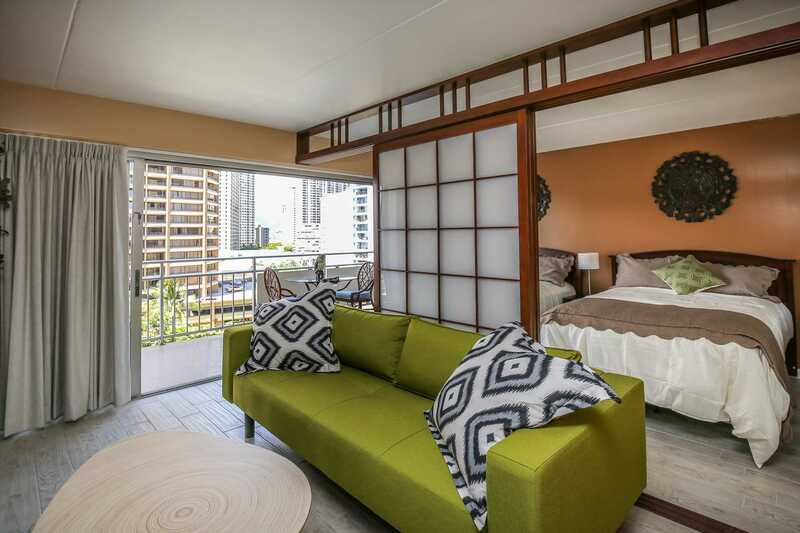 We have stayed in many hotels and condos in Waikiki and this is by far the best. 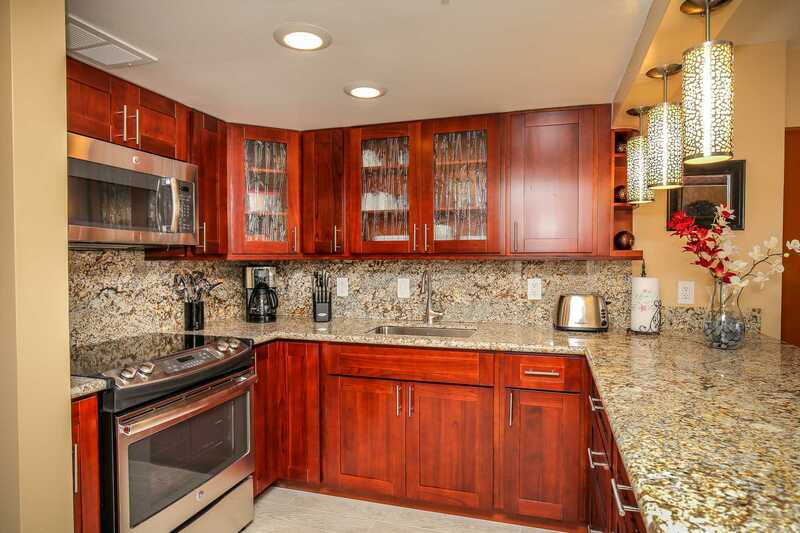 This is a very clean, beautiful, well stocked condo! 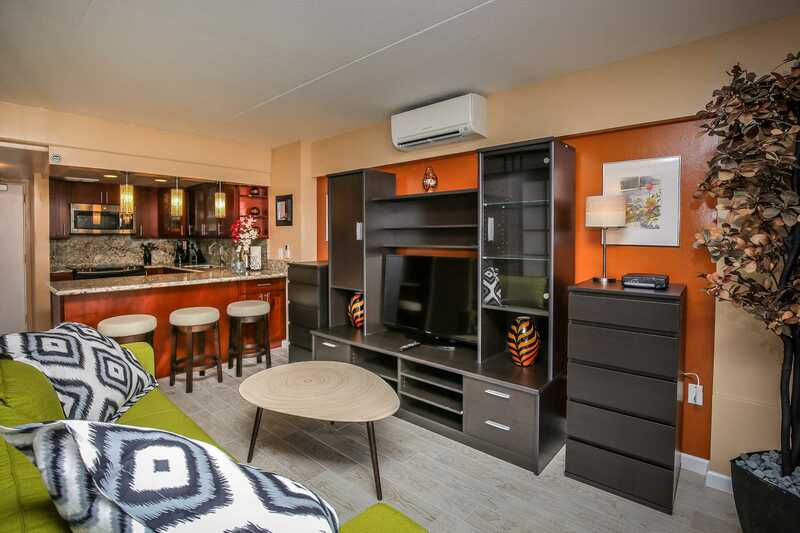 The location is exceptional as it is right next to so many wonderful shops, Starbucks, the A. Mall, and the beach! It was perfect to go for a run in the morning and our whole family enjoyed the pool. The staff was welcoming and the valet parking attendants were kind and friendly! It was wonderful to be able to walk right in and check out on our own. Our children have even voted to return, hopefully sooner rather than later! You definitely won't be disappointed. 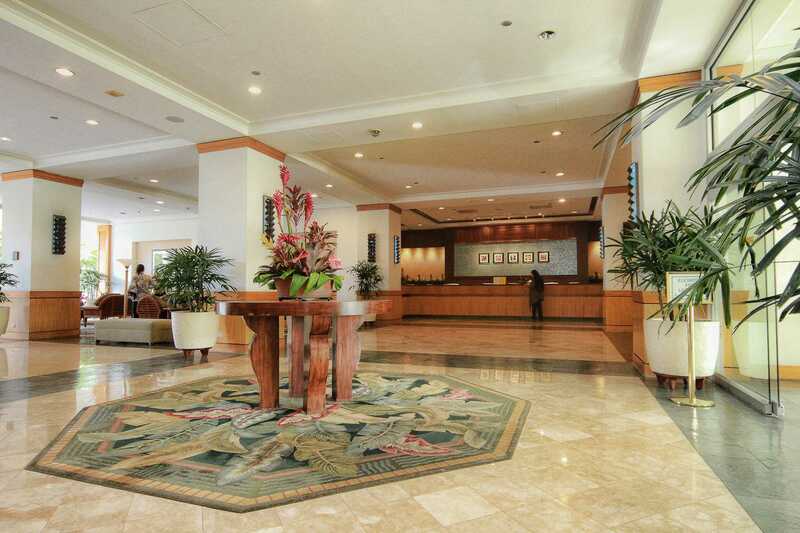 Unit is well-appointed, on the Ala Moana Blvd. side but there is little street noise with the lanai doors closed at night. 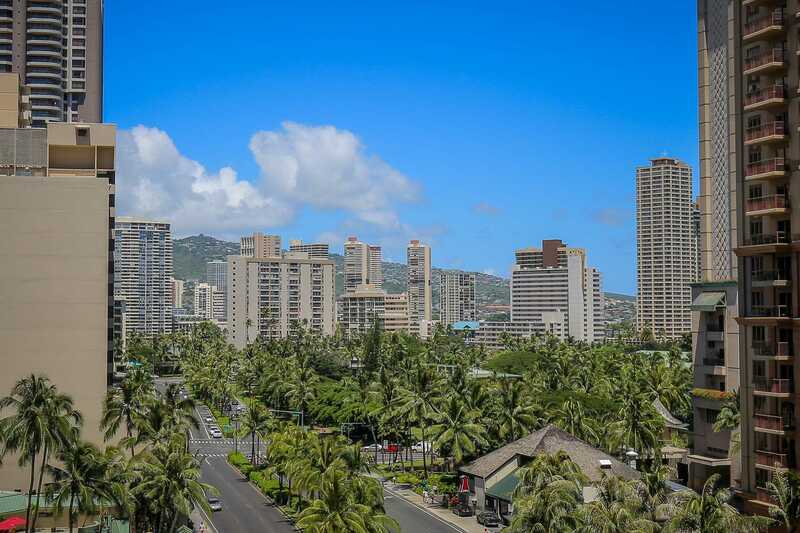 It's a 2-minute walk to Kahanomoku Beach, and restaurants, fast food joints and grocery stores are nearby. Overall had a great stay. 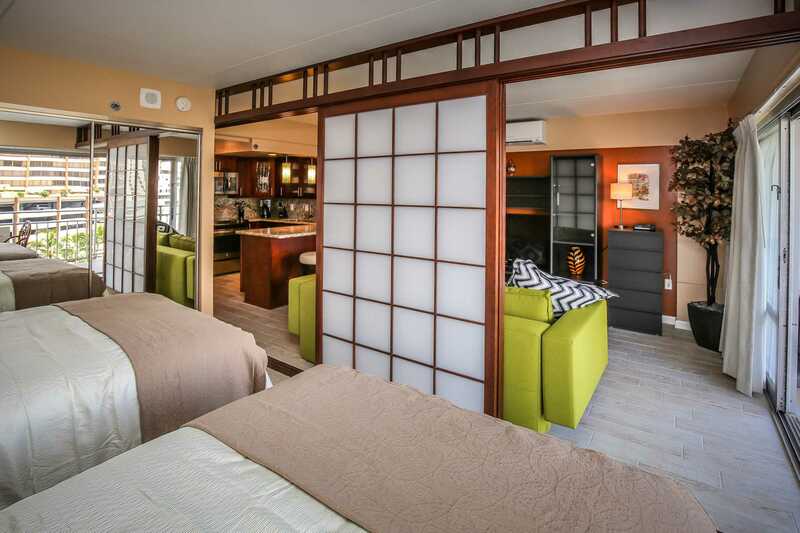 Great private resilience inside the Ilikai hotel! Smooth, self check-in with no problems. Looks exactly, if not slightly better than the photos. 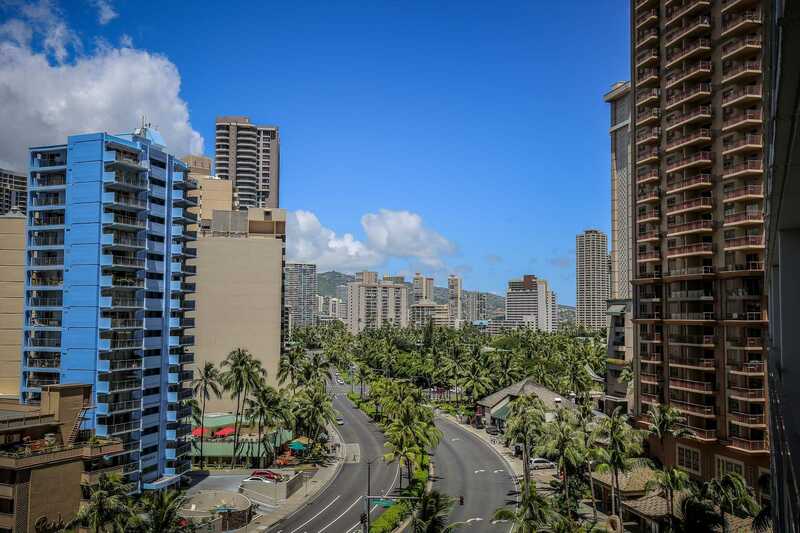 Great location, Waikiki beach is a 5 minute walk away and there are restaurants/cafes/convenience store/shops in the hotel as well as in walking distance. Ala Moana mall was a 10 minute walk away and the area is very easy to navigate. It was a little bit of a tight fit for 5 women to share, but we definitely made it work. Overall, we had a great experience!" great little place!! stylish, and so close to beach. great parking staff too. Only $28 for a 24hr parking option (valet as well). right across from a ABC store and bus stop literally at the corner. 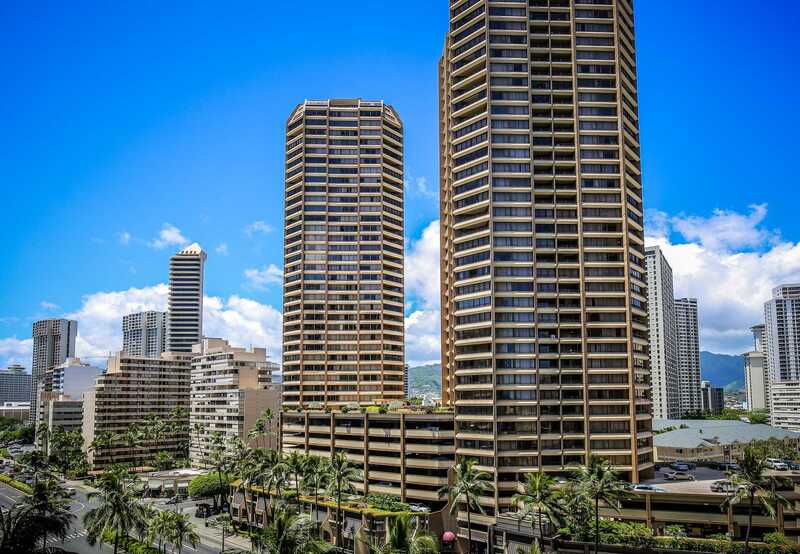 This place is a great choice for a Waikiki holiday. It's a fair walk into the main street and beach of Waikiki, but all shuttles stop right at the front door so getting around is still very easy. 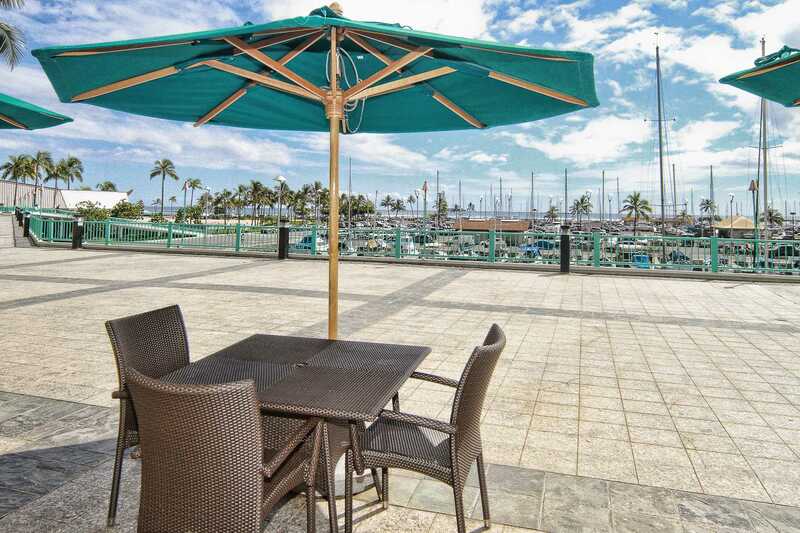 Walking distance to the fantastic Ala Moana shopping centre is a positive. 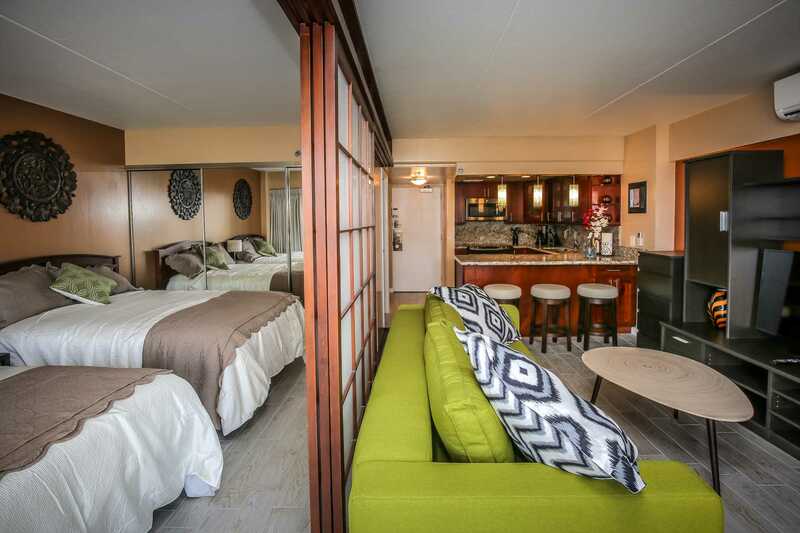 The room are clean and there are plenty of added extras such as towels, beach chairs, boogie boards....etc. Overall, we wouldn't hesitate to stay here again. Great condo with great location. Family of 4, we didn't feel like we were walking all over each other. Would recommend this condo to everyone. The only downside was the size of the pool but that had nothing to do with the actual condo. Thanks again for the great hospitality. Our stay was amazing! 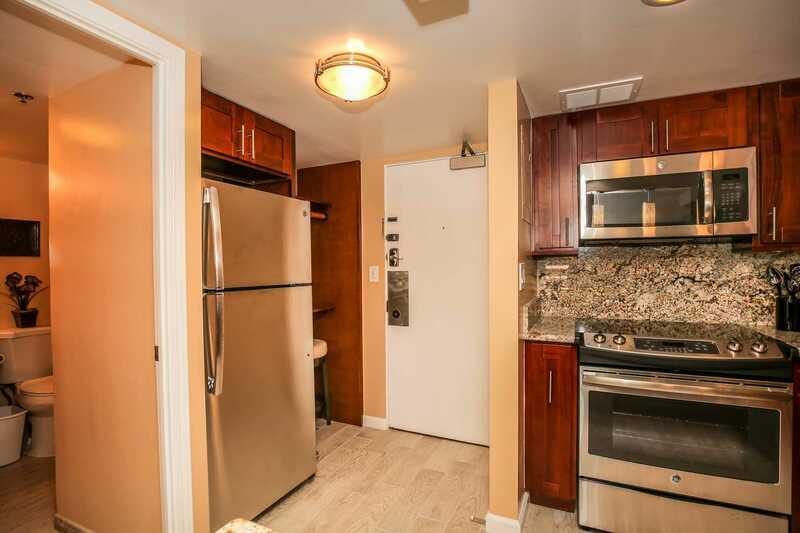 What a lovely, clean, updated property. 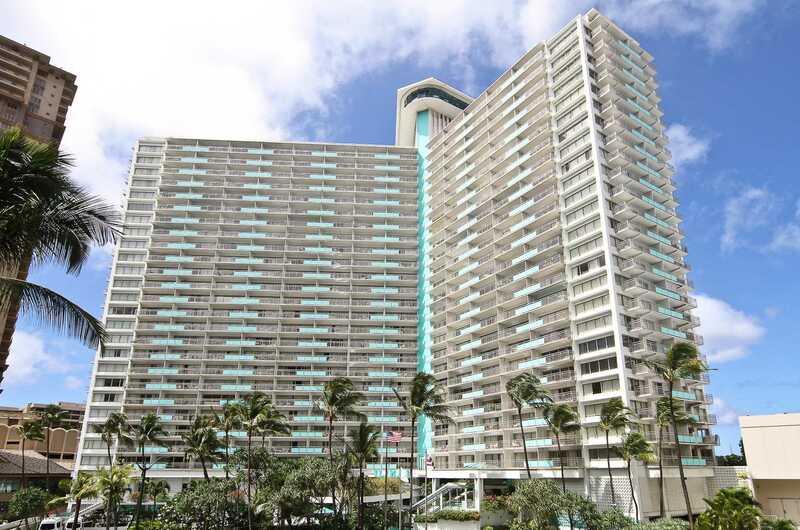 I stay in Honolulu regularly for work, and this was by far one of the best properties I've enjoyed. Apartment was really nice. It was great to be able to cook during our stay. However, apart from salt & pepper there was not much basics. We did not have what other people called starter supplies. It would have been nice to have some bowls with covers for leftover as well as a baking dish. There was only 4 faceclothes provided for 2 adults staying 5 days, we could have used more. Otherwise it was great with proximity to the beach, the shopping center and much calmer than being in the center of town. Buses & trolleys were stopping right in front of the Ilikai which was very convenient. We are glad the Guest had a great stay. Our Guests are encouraged to call us with any concerns as stated in the condo instructions, condo info sheet, refrigerator magnet and business card. Hawaii is tropical. Due to health and pest concerns, we do not leave many open condiments in the condos. 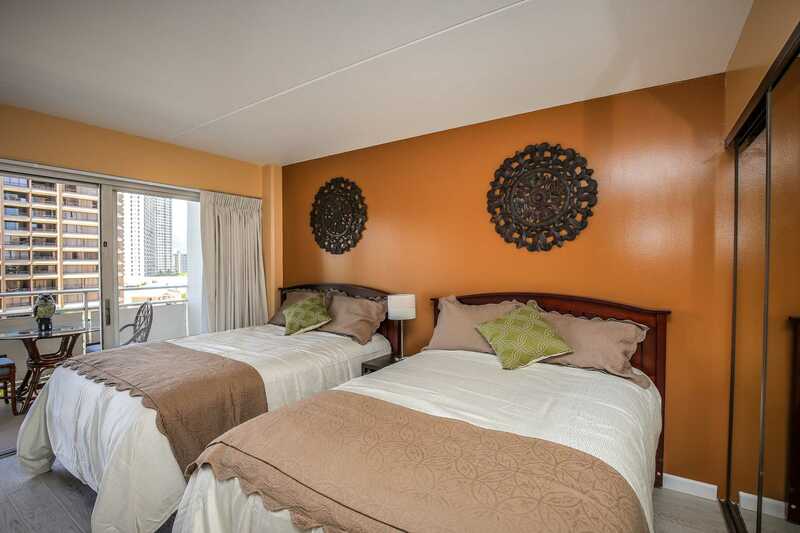 The condos are equipped with linen and towels. There is a coin-op laundry on every floor. My husband, 2-year-old daughter, mom, brother, and I stayed in condo 815, which has city/mountain view. It was great! Our flight was early and we got to the condo earlier than expected. I had emailed HVP to let them know and that they can charge me the extra fee for early check-in, but they emailed me back and said it was complimentary. How awesome is that! I loved the keyless entry and receiving instructions before my arrival. The condo was very clean! Trust me on this because I took a Clorox wipe to see how much dirt I picked up and there was barely any! Yes, I was pleasantly surprised. :) We stayed for 10 nights and it felt like home. We did run out of toilet paper, but that is always expected with any condo. There were plenty of towels, beach towels, beach chairs, coolers, linen for the sofa bed, extra pillows and blankets, kitchenware and utensils - everything! Well, except for a dishwasher, but that was fine for us. The full size beds were VERY comfortable and the sofa bed was okay. I slept on the sofa bed with my mom and daughter and never woke up with any aches or pain. We've stayed at the Ilikai before (with an ocean view) and the only slight downside with the city/mountain view is the sound of the ambulance going by, but I would stay here again. In my opinion, the Ilikai has the perfect location. It's close to Ala Moana Shopping Center, Don Quijote (went there pretty often for groceries), the lagoon, different restaurants/bars. The bus stop is also right outside. There are two pools - one for swimming and the other (newer) one is for sunbathing and great for small children. HVP provides the pool pass. Overall, we would stay here again. 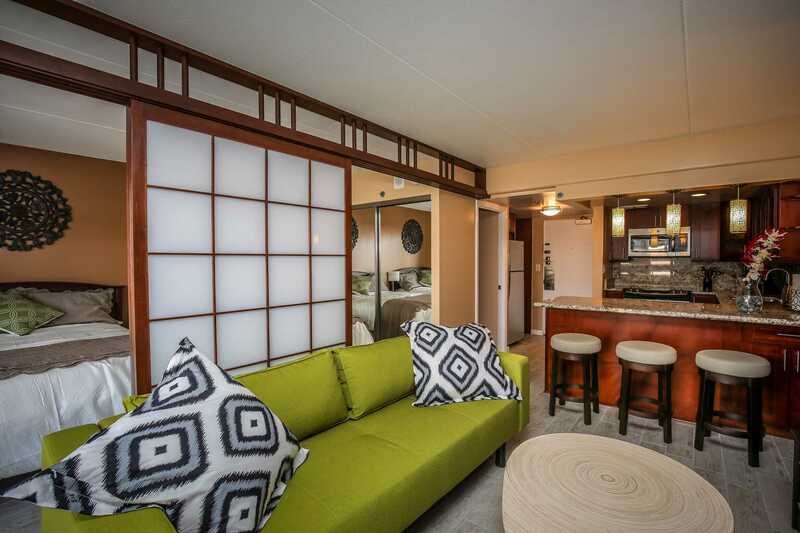 Great location, great condo, and great experience with HVP! 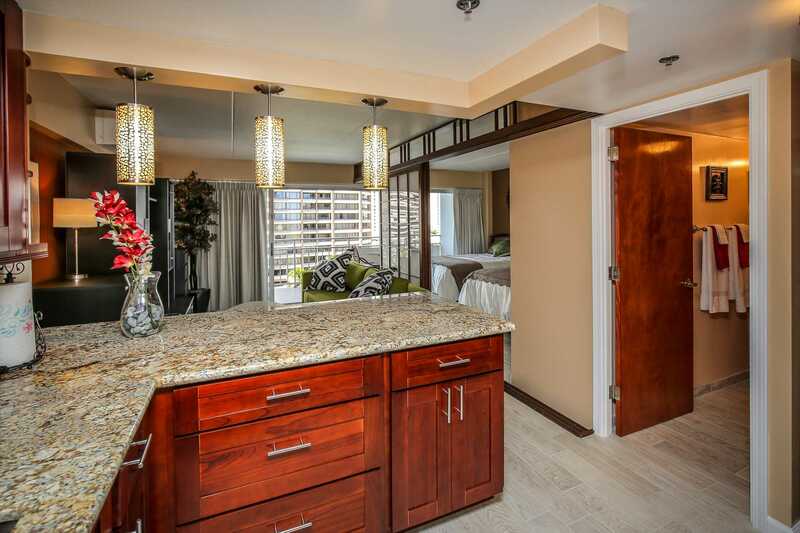 The condo is as we expected.The location is really great,we walked to Ala Moana almost everyday as it is only around the corner,you can see it from the hotel entrance.Bus stop is right next to the hotel,quite a few restaurants nearby.the staff from HVP were really helpful,they always respond promply and let us check in early at 9am.Will definitely recommend and will return. Our room was beautiful and clean. 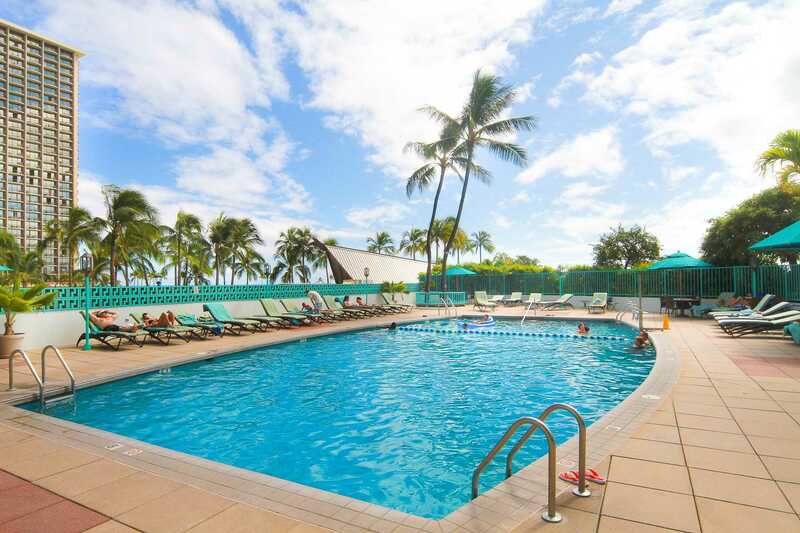 Ilikai Hotel is beautiful and conveniently located near restaurants, shopping and beach. We enjoyed our stay at the Ilikai. Our room was beautiful and clean. We would definitely recommend it to others and would stay there again. The price was very affordable for what we got. We loved our stay here - thank you! I loved our stay here! The condo was gorgeous! Fully self contained, wi-fi, two comfortably double beds, a pull out futon and a bathroom - it was perfect. You are provided with cutlery and utensils to make meals which we did a few nights while we were there. You are also provided with beach chairs and towels. The views from the balcony were great. The resort is fully decked out with restaurants, bars, pools and a little grocery store. The location is fabulous! 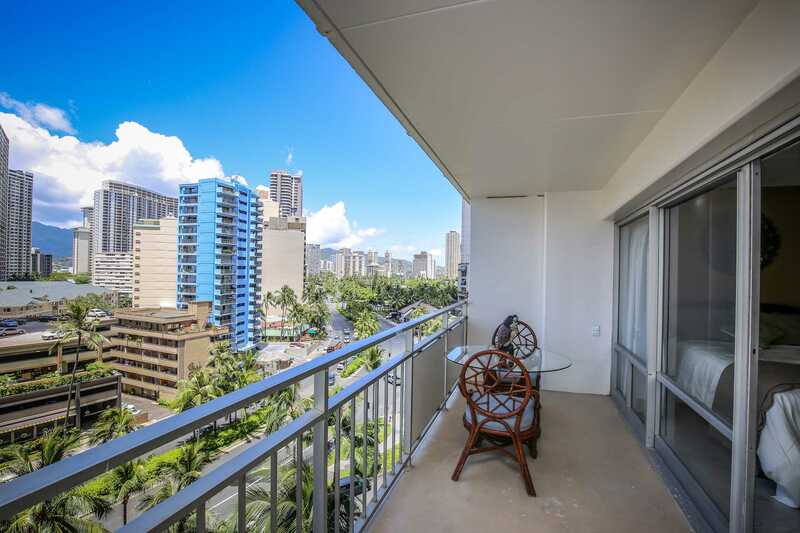 Walking distance to the main street of Honolulu and a short walk over the bridge to the Ala Moana Shopping Centre. There is also a bus stop down the road if needed and cabs are plentiful. Communication from the owners was great - they answered any questions I had quickly and just before our stay, they sent out all we needed to know. I loved this place so much I was sad to leave it! I would stay here again in a heartbeat and anyone thinking about booking here - you will not regret it. Mahalo for a great stay! Great location, well stocked with basic necessities, very happy with the room, hotel, area and service! Highly recommended! It was a great visit. Thank you. It was a great week for my business trip. The location was also perfect to enjoy shopping and beach. 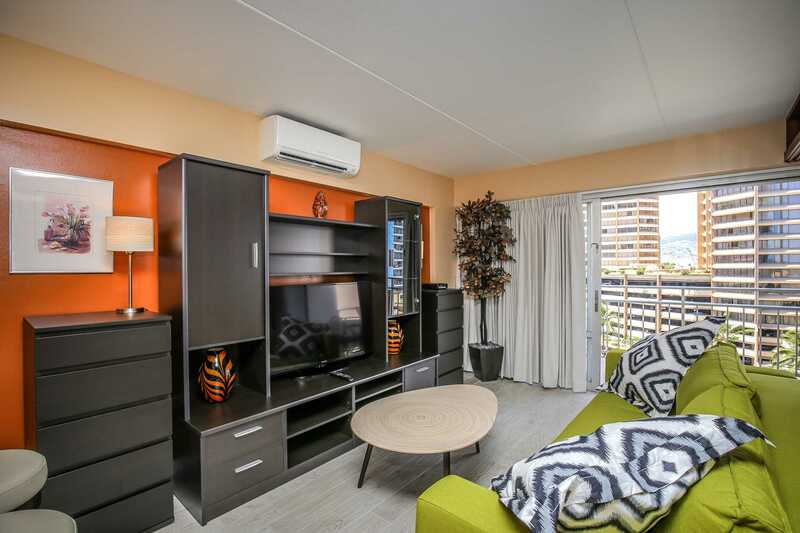 This was a great unit and had everything needed for a very relaxing and comfortable stay. It was nice having the dividers between the sleeping area and the living area. Lots of closet, cupboard and drawer space made it easy to have the place uncluttered at all times. Having a keypad door entry was great, never had to worry about not taking keys with you. The location was central with such good access to The Bus. Loved the pools, especially the one on the 2nd floor which was great for sunbathing and young children and also had the umbrellas.Would definitely stay there again. Great location with high cost performance. We enjoyed the stay so much. "very good location,very convenient transportation,and very thoughtful host ,the host prepared us a lot of swimming stuff,I will come again ." 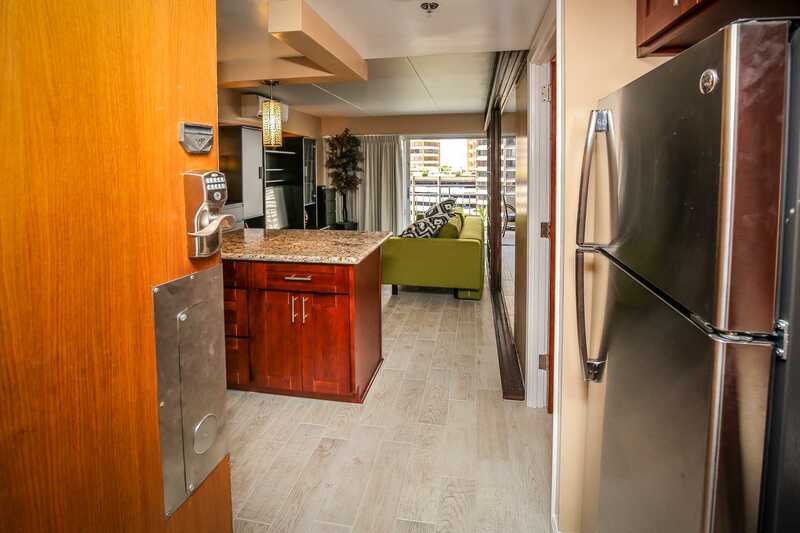 Awsome condo, had everything we needed! Stayed here for 15days with my partner and 2 children aged 6 & 2. So close to everything including the Lagoon & beach. Kids enjoyed the pool almost everyday. 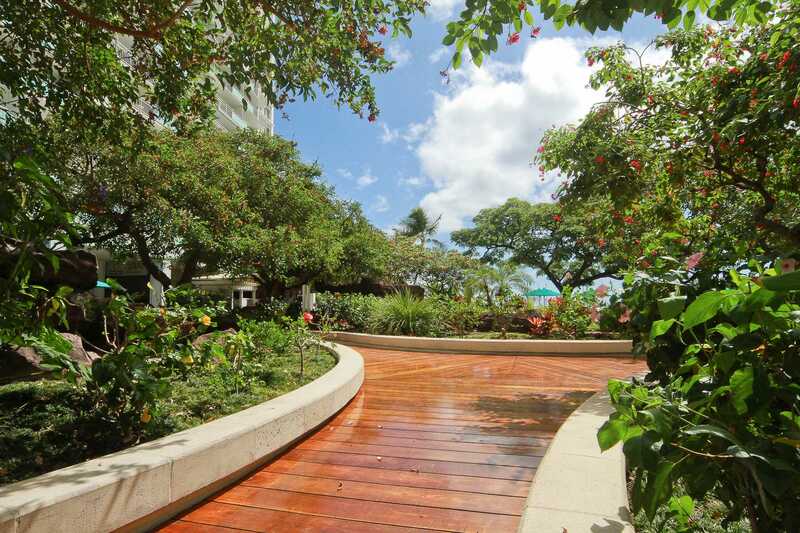 Walking distance to the Ala Moana shopping mall. The bus services is right at the Ilikai, so convenient! A few really good restaurants walking distance. Beds were comfortable & aircon was the best. Kids loved the fireworks on friday nights! Definately recommend this hotel if your not fussed with the city view. We loved it, thankyou! The Ilikai #815 was a great place to stay. The ocean is only a few steps away. The restaurant overlooks the marina and we enjoyed listening to live music while we dined on Mahi Mahi. The condo is updated and was a very comfortable stay. There are a few additional amenities (i.e. beach chairs and body boards for the ocean). I would recommend the stay! Really enjoyed our stay! Very clean suit. Great bus services are available right outside the ilikai door. Ala Moana mall was only 15 minute walk. You don't even need a car go get around. I would definitely recommend this suit to my friends and family. Thank you for having us! My husband and our 2 daughters (ages 9 and 13) stayed for 2 weeks attending my nephew's wedding. We thoroughly enjoyed our stay at Ilikai. 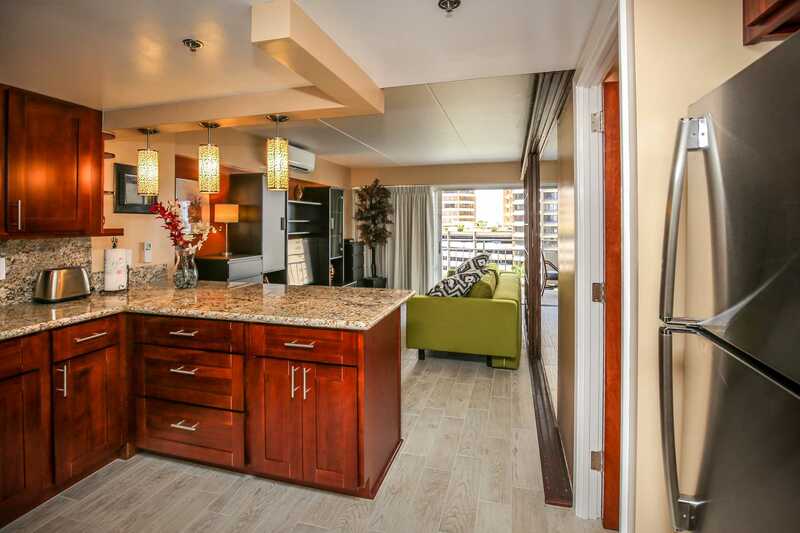 The condo was very comfortable, great kitchen, and an ideal location (prefer Alamoana Blvd than Waikiki). We will definitely want to stay here again. Thanks for making our time in Hawaii a memorable one! I base my unit selection on the furniture and kitchen, as if I'm going to buy the place and not just staying for the week. This unit fit the bill. 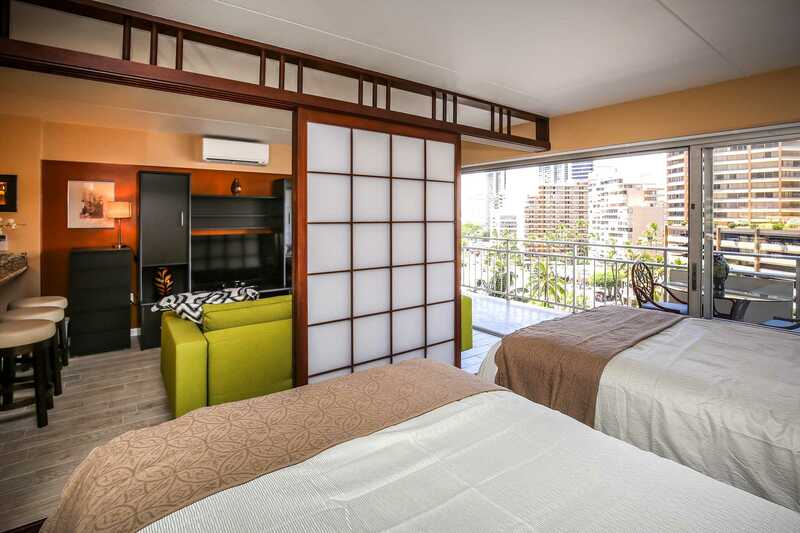 We always look for a place with an actual bedroom door, but the shoji screens were sufficient, and when open, did not make the sleeping area feel claustrophobic. 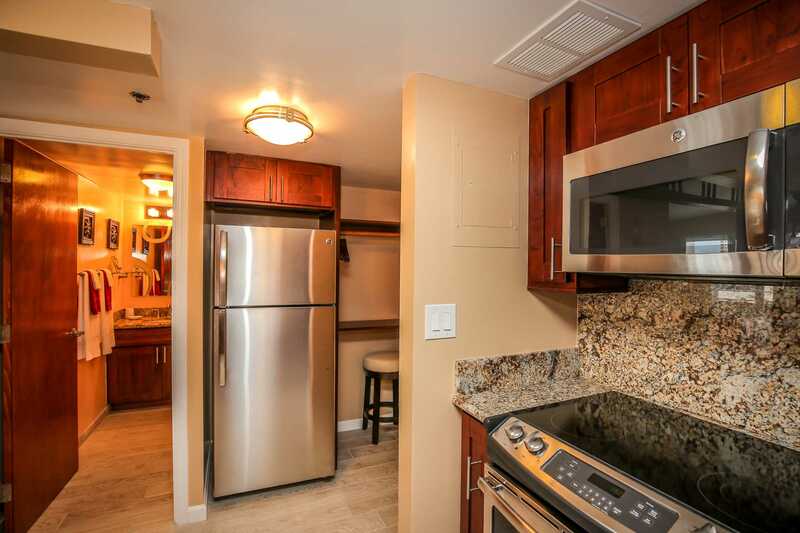 Kitchen had nice stainless appliances, everything was clean, and it was well stocked with dishes and silverware. We never turned on the stove and didn't miss a dishwasher; we made good use out of the full size refrigerator (ended up buying bags of ice instead of waiting for the icemaker) and microwave. 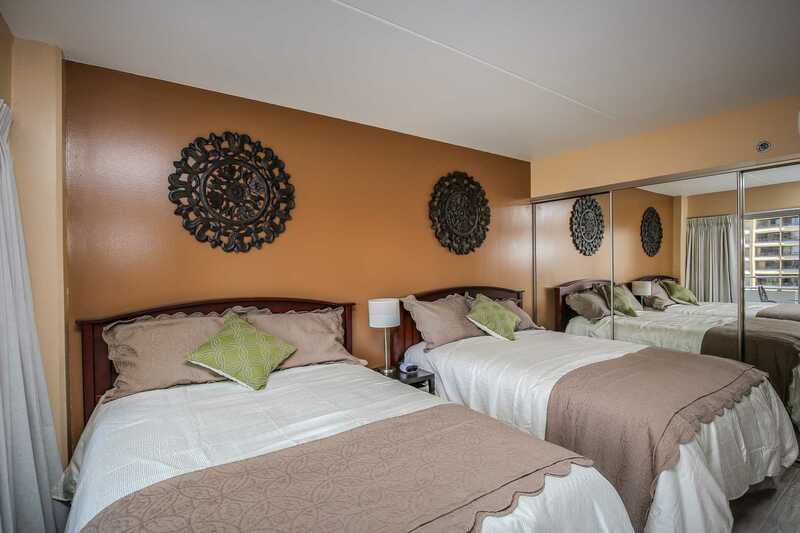 The beds were super comfy and firm; full length of closet and plenty of hangers for all of your clothes. The only things in the bedroom are the two beds and a nightstand; dressers were in the living room. Luggage stand was handy for one of us. 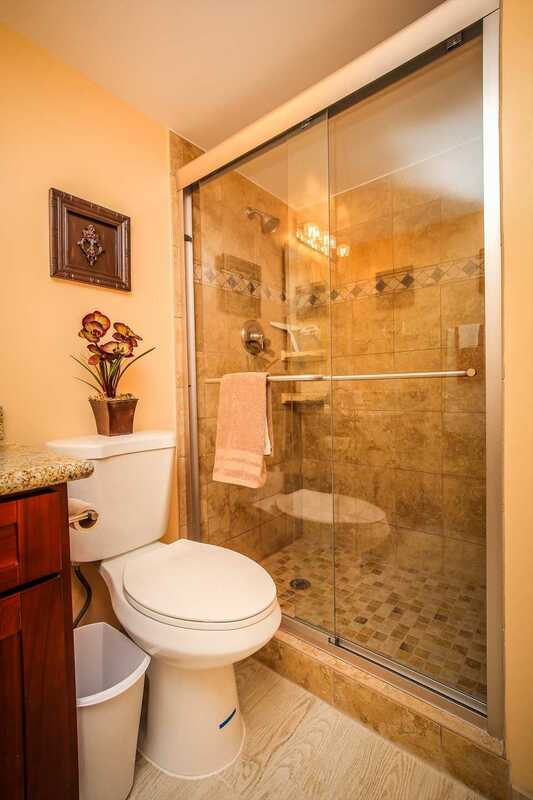 The bathroom had a good size shower and a vanity that could hold your toiletries. Only downside was there was no fan, but it didn't really get that steamy/foggy with the door open. 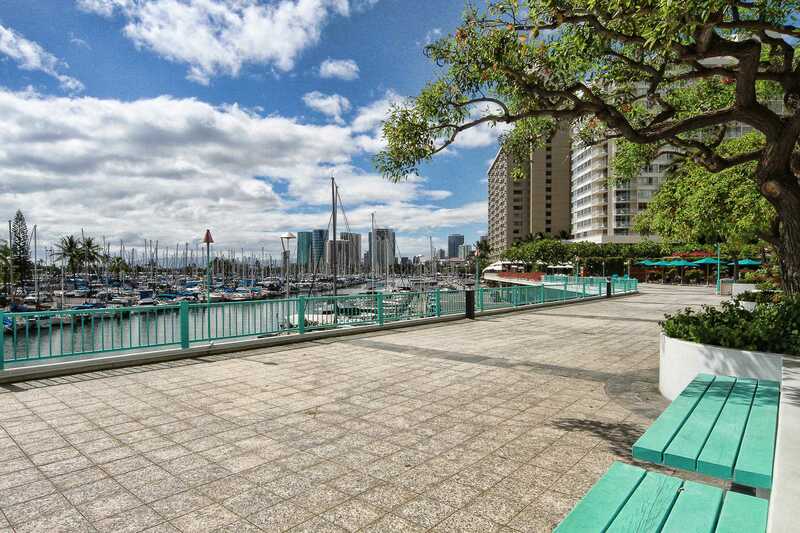 Yes, a place on the marina side is nice, but how often do you really sit out on the lanai? I would definitely put this unit in the running for a return trip. We like the Ilikai a lot and have stayed here probably the last six trips. The only thing that would make it better would be to charge less for the valet parking. 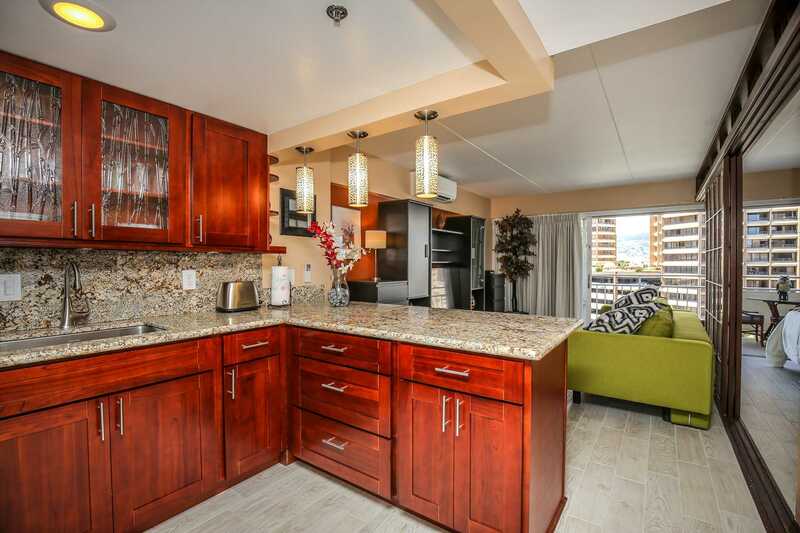 Condo was just as the website described and looked just as the pictures shown. Condo was clean and comfortable. My family and I did not have any issues with Hawaii Vacation Properties from start to finish. They were always readily available if I had any questions. The location was great and the valet service was very convenient. I would recommend booking with Hawaii Vacation Properties and would also use them for my future visits to Hawaii!!!!!! 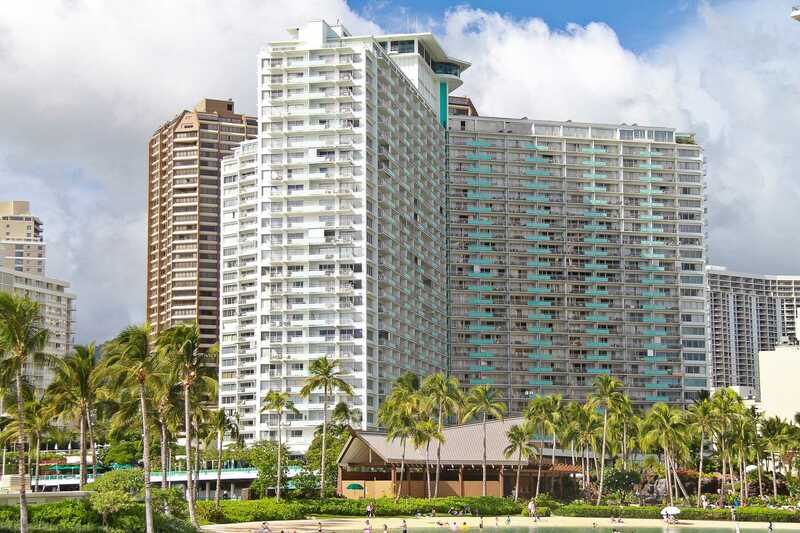 Thank you Hawaii Vacation Properties for making it an easy stress free process when looking for a place to stay. Fantastic unit. Very comfortable for our family of four. Everything was like new, very clean and in great condition. It didn't have an ocean view but we were happy to have the newer accommodations and glad we did. We had a very enjoyable stay and appreciated the little extras like beach chairs, umbrella and cooler bag. Beds, pillows and sheets were very comfortable and clean. Highly recommended and would come back again. Our visit was very nice. The room was clean and up to date. It was great to have the little extras like beach chairs and a cooler. There was a little mix up with sheets. We had four people staying in a room that could hold five. We intended to use the two beds and sofa bed. However, there were not any sheets for the sofa bed. Plenty of clean towels! The view was fine but it wasn't ocean view. The location was very close to the beach and everything else. We would defiantly stay there again. The extra bedding for the sofa sleeper is kept in the closet. If a Guest can't find it, they are always welcome to call the Local Contact number posed in the instructions, back of the door and on the refrigerator door. Tres beau sejour en juillet 2015 au Ilikai 815. Hotel tres bien situe, pres de la mer et du Hilton.Piscine petite mais bien entretenu.Cuisine tres bien amenagee, mais manque un peu d'ustencils. On a apprecie les chaises de plage. Endroit parfait pour les feux d'artifices du vendredi. Personnel de la piscine et les voituriers excellents. Personnel masculin de la reception par contre peu enthousiasme. Restaurant au rez de chaussee ok sans plus. On y retournerait demain !!!! 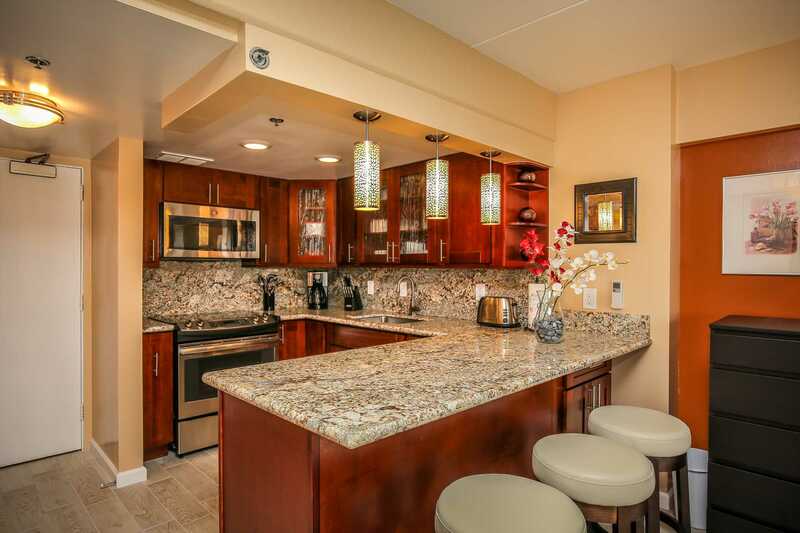 The check is was hassle free, the condo was very clean and updated and conveniently located. We definitely enjoyed our stay here and would definitely stay again. This unit was perfect! Modern and beautiful. Everything was great without any problems. Once we entered, the unit was prepared with air-conditioning running and lights on waiting for our arrival. Very comfortable stay. Would definitely return and definitely recommend. The unit was clean and comfortable. The self check-in was convenient. 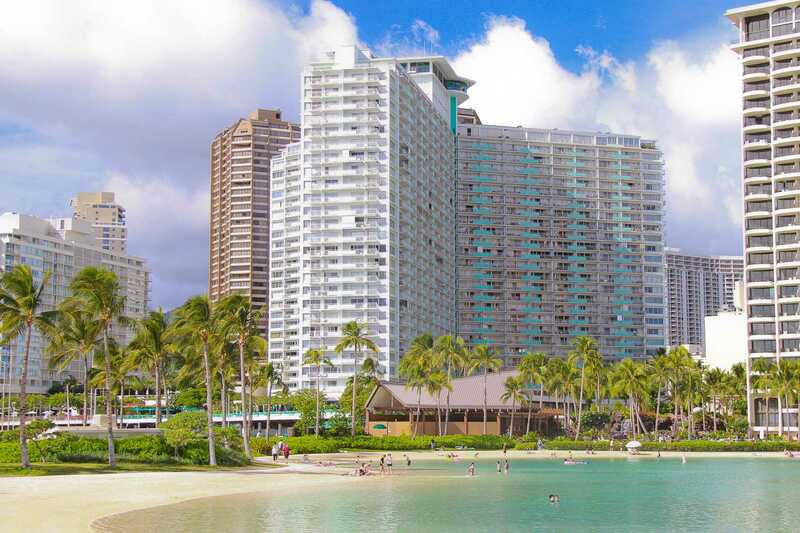 Location was fantastic as this was very close to rental car companies (across the street), the Hilton saltwater lagoon, Ala Moana Shopping Centre. It made it very convenient in travelling with two kids under 3. 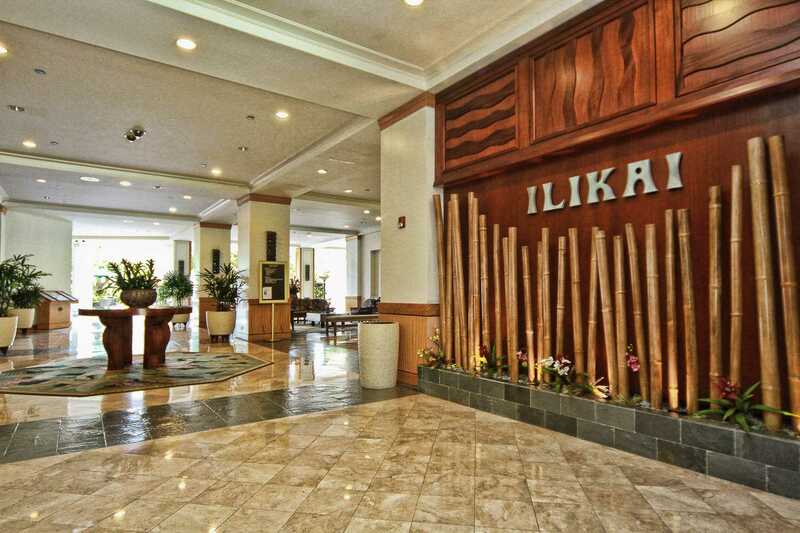 We had a fabulous stay at the Ilikai. Room 815 was excellent, had a great kitchen - very tidy and clean, same with bathroom. Couldn't fault the cleanliness. Well presented. We had come from the marina view, didn't think the street was as appealingly. We would definitely stay again and re moment to family and friends. This unit was perfect for my sister and I. Clean, comfortable and great location. Beds were soft and cosy. Only negative was the internet was intermittent so was a bit annoying when trying to do banking, emails, facebook etc. would recommend to family and friends and would stay here again.